Of course, you can rightfully argue that most users of the budget machines don’t really care what is pushing the numbers inside the case, but the fact is that currently it seems only Intel is supplying processing power for the various portables. This is in no way mere chance and AMD really seems to have little interest or actual benefit from powering Chromebooks. You have to at least get paid for that value when you’re working on graphics. You go below that, and you’re looking at $7 chips. Mark is definitely referring to AMD’s current APU line. The fact of the matter is that these CPU and GPU combos currently offer very nice performance for the buck, but you are still talking about silicon with fairly advanced graphic capabilities. 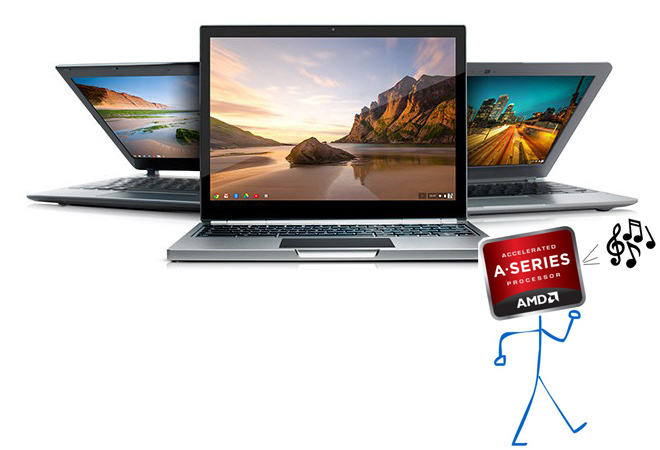 This is not to say Chromebooks wouldn’t enjoy the extra pixel-pushing power, but their price tag simply doesn’t leave much room for AMD to make a profit out of the APU chips. Coupled with the fact that the segment may be growing fast, but still represent a very small fraction of the market makes the whole ordeal very financially unviable. Bottom line is that if you are on the market for a shiny new Chromebook you will have to settle with a low-powered Intel chip, at least for the time being. And if you are truly a Google fan, you could splurge for the top of the line Chromebook Pixel or even wait out until the newer model is released, which frankly at that price tag shows true brand dedication.